I remember the first time my husband and I went to our local homeschool convention. Our oldest was 2 (I’m not joking – the HSLDA guy actually laughed when we told him that) and we just wanted to dip our little toe into the waters of homeschooling and find out more. What we got was instead a firehose of information and bit of a culture shock. But it was SO good. And every year we keep coming back. We wandered around picking up parenting tools, learning about homeschooling, and marveling at the diversity of the group. Our oldest is now 8 and we’ve got just a few years of homeschooling under our belt. Not experts by any stretch of the imagination, but not total newbies either. Every year, we encourage homeschoolers to GO TO THEIR local state convention. I’m going to share with your our top reasons why you should go, along with some options if you CAN’T make it this year. We absolutely love our state homeschool organization, the Oregon Christian Home Education Association Network (OCEANetwork). We fell in love with it that first year and I think we’ve only missed one year since then. Yes, there are “big” conventions we could travel to if we wanted, but we choose to go to the state convention instead. We get to know other Christian homeschoolers, appreciating our common goal to raise children for the glory of God, and provide a great home education. The experience of that unity AND the diversity has been unique for us, and we love it! This year OCEANetwork has family movie night, dad’s shop talk, lunch meetings based on stage or interest, and more! As homeschoolers, we would serve ourselves and our children well to seek out great encouragement. Whether we need parenting tips, help with a struggling reader, an overview of homeschooling methods, etc., we’re sure to find it at the conference! We love to be able to give back to our state homeschool conference, and the fact that it is so local and run by volunteers makes it personal. We can talk to the organizers and board members, hear about immediate needs and pitch in, become supporting members, and so on. We get to be a part of something (and YOU CAN TOO). While we buy what we can from the conference vendors, what we can’t get there is purchased from places like Rainbow Resources or ChristianBook.com. We also are blessed to have a local used homeschool bookstore we love called Exodus books! We GLADLY spend our homeschool dollars at the conference. Why? 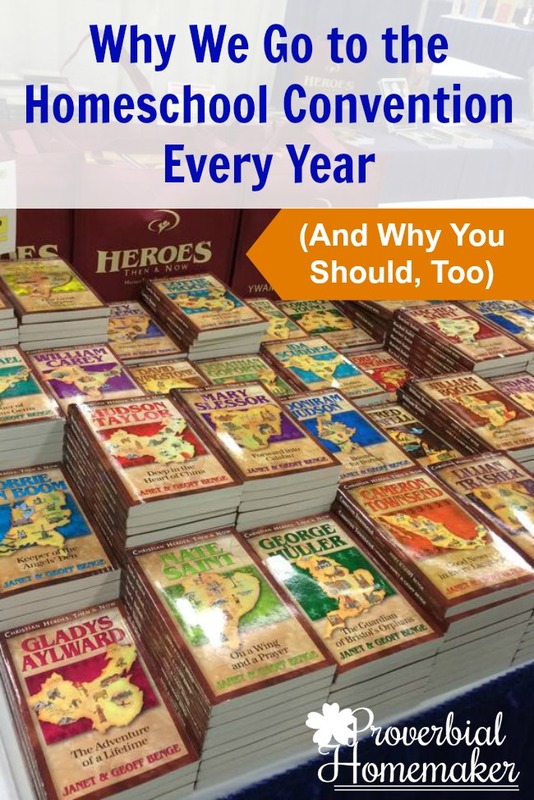 Because it helps keep the conference running, supports the organization all year as it supports us, and also supports the homeschool vendors that work so hard to be there and serve homeschooling families. We also really appreciate being able to talk with vendors, ask questions, compare, and actually handle the curriculum in person! So many purchasing mistakes can be avoided that way. As we attend each year, become more involved, and participate in the various activities, we grow in wisdom and experience. This is mostly because we are around others with vastly greater wisdom and experience than our own and we get to LEARN from them! We have come to know some truly amazing people, and even find some invaluable mentors, in this way. Sometimes it can be easy to get lost in the homeschooling weeds. The details and daily rhythm cause us to loose sight of the vision and beauty of homeschooling. Recapturing that vision – finding that wonderful refreshment – is critical in helping us avoid burnout. My husband and I have been blessed to be able to make a weekend of our conference each year. As we get ready for the conference, we plan on a fancier-than-usual hotel, some meals out, and enjoying slowing down just a bit between conference days to catch up and process what we’ve learned. If you can swing that, I highly recommend it! But if you can’t, the commuting time can still be surprisingly helpful to catch those moments of reflection. OCEANetwork and other state homeschool organizations work YEAR ROUND to provide support, encouragement, and practical helps to us homeschoolers. They are there to point us to support groups, get us the information we need about requirements, and they go to bat for us to keep homeschooling free and unrestricted. It’s a HUGE deal and worth our support! Yes, there are bigger and fancier conferences out there than your state conference, most likely. But I hope you’re now as convinced as we are that attending your state conference is a superior choice. They know the resources, the people, and the local state concerns better. Will you be going this year? Can’t Go to the Homeschool Conference? I know that sometimes it’s not possible to make your state conference for the year. There are some great options you can use instead! Here are my two favorite. Conference Recordings – Be sure to purchase conference recordings, as I’m sure your organization provides them as OCEANetwork does. We have purchased those nearly every year as well, even though we attended. SO many hours of encouragement and tips we can learn from during the rest of the year! 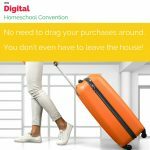 Digital Homeschool Conventions – This year a group of homeschool bloggers are putting on a Digital Homeschool Convention and it does look great. It’s FREE, first of all (for a limited time), and there are great speakers and digital vendors to buy from. 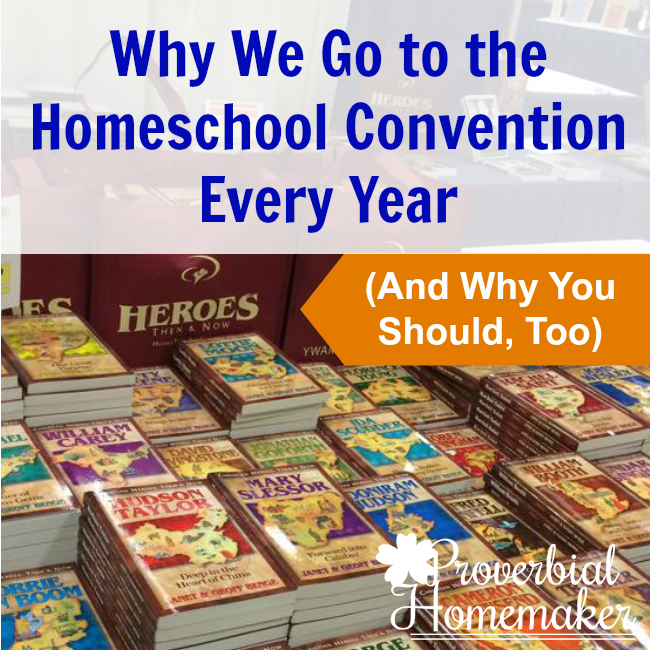 It doesn’t replace the state homeschool conference by any means, so do try your best to make those, but it can be a great resource when you can’t make it in person! Thank you for this post. We too live in Oregon and I contemplate going to the OCEAN conference every year. You’ve sealed the deal for me for next year. This giveaway is also such a blessing! Thank you!! Oh man. I JUST bought all of this year’s curriculum two weeks ago from Rainbow Resource! I did forget one or two things, though, and I haven’t entirely figured out the year for one of my kids. Probably I’d hang on to it for a month or two, make sure we like what we’re starting this year, and then buy the next level of everything! Beast Academy math, Apologia worldview, maybe splurge on some Apologia science that we want to try but haven’t . . . so many choices! I would buy a science experiment supply kit, readers, and bible curriculum! If I were to win I would buy math manipulatives and some fun learning games. Thank you for this amazing giveaway!!! I would purchase all our curriculum for the next year! If we were to win this giveaway we would purchase a few Preschool items for our youngest children, and the remainder of the curriculum we need, and maybe even a few extras we’ve really been wanting! With a gift this large I would also find another family to share this blessing with! Thank you for the giveaway!!! One family will truly be blessed. If I won, I would buy All About Reading and All About Spelling as this is an area we are struggling with. Thank you! My husband and I attended our first homeschool convention a couple weeks ago. What a wealth of information! We will plan better for next year so that we can spend the whole weekend at the convention. I would buy all of my curriculum for next year. What a wonderful giveaway. Thank You for doing this. This is an amazing giveaway that is going to bless a homeschool family so much. We found Rainbow Resource in the beginning and have used them every year since. Thank you. I forgot.. We would buy some science extras, several read alouds, our next level of spelling, some music items and so much more. I love Rainbow Resource, and maybe I would buy updated high school material. Thank you so much for this giveaway opportunity! If I won, I’d look into some of the Apologia Science books – especially high school level, and then some science kits. Maybe a German learning aid, or Latin, as well. I live in SE Washington and have wanted to attend the Oregon conference, but have yet to make it. I’m hoping next year will work. I’ve got a high-schooler soon, and am wanting moral support for homeschooling him. If I should win the Rainbow Resource gift certificate, I would buy one special thing for each of my two sons still in homeschooling, and I would donate the rest to homeschoolers in nearby West Virginia who lost everything in the recent flooding. If I won I’d buy my prek’er some manipulatives and things to help her have the great start that my oldest had. Thanks for the raffle! I would buy foreign language, art, music, and other fun enrichment resources! If I won, I would invest in some more Grammar help and the cool science extras I can never afford. Thank you once again for this chance. If I won, I would use the coupon on a variety of subjects for my 2nd grader. I’m mostly interested in some of the Bible and science resources. I would buy preschool hands on items! I would buy the Apologia AP Biology dvd, apologia Gen Science notebook, some IEW writing curr., and probably another apologia Land Animals notebook. It would be greatly appriciated and I’m sure I could find more !! I would buy the Apologia AP Biology dvd, apologia Gen Science notebook, some IEW writing curr., and probably another apologia Land Animals notebook. It would be greatly appreciated and I’m sure I could find more !! If I won, I would pick up our needed math and science curriculum. This would be a huge blessing to our family. Thank you for hosting. Thanks so much for the giveaway– and for finding the time and energy to keep this blog going! Thanks so much for the giveaway– and for finding the time and energy to keep this blog going! I’d buy lots and lots of good books! If I were to win I would buy resources for 1st and 5th grades. Thanks for this opportunity. If I won this giftcard, I would buy the Diana Waring History Revealed series. I have been wanting to use this curriculum for several years now. I would get Spanish learning tools for my kids, like little pim and rosetta stone. I absolutely love going to the Midwest Homeschool Convention! The first time we went was also when our oldest was 2 (and he’s now 8 like yours, with three little siblings!). I remember being completely overwhelmed by all of the information…and very thankful that we had several more years to dive into the ocean of options to figure out what we wanted to do! I encourage all who are new to homeschooling to attend a conference! The encouragement, the resources, the networking, the expo hall…it’s wonderful! If I won the giveaway, I would buy science supply kits and books, just for a start! What a blessing and what fun! Thank you so much for letting us all dream a little! thanks for a fantastic giveaway! We’re entering our first full year of homeschooling this year (pulled my kiddo at Christmas last year) so I’m excited to see what this year holds for us! Books for all the littles! I would love to get some art and science materials to do more hands-on projects! I like Rainbow Resource for the many odd and end items I need or could want in my homeschool. I buy my planners there, coloring activities, history supplements, and even my science books (apologia). I’m no more in need than many other homeschool families but that doesn’t mean I wouldn’t be truly grateful to win such an awesome giveaway. What an excellent giveaway! Everyone can find something great at Rainbow Resources! I’m a fairly new homeschooler–if I win the giveaway I’m mostly interested in ordering some Apologia Science with Jr. Notebooking options! I would buyou K or 1st grade materials. I have children going into both. Yikes!! This would be fantastic. I have a mentally challenged son who is a young man yet he is still working on a 2nd to low 4th grade level depending on the subject and if he likes it or not that is why there is such a large difference in the grade levels. But in 2001 we were told he would never do better than that. Being Jewish/German/Irish/Austrian Hungarian I come from a family that you never said never and now he is getting better. Thanks so much for all the advice, printables, links, and homeschooling suggestions! If I were to be blessed to win this giveaway, I would purchase all the Apologia Science textbooks and journals for Anatomy & Physiology and Astronomy for our school year (maybe even a few of the lab kits)! I would buy a All About Spelling, some BJU books, a Science curriculum, and math manipulatives. Curriculum exchange! That reason alone would be enough to attend. It sounds like your local organization is fantastic. I would love to add Story of the World audios Vols 3 & 4 to our curriculum this year. Also Writers in Residence. If I had this awesome prize I would buy science kits and curriculum. I’m searching for something that will grab my kids and be easy for me. I would buy Math for my Junior Higher and Science Books for her also. I am very excited about this giveaway!! 8th grade math and science curriculum! I am headed to the OCEANetwork Homeschool Conference this weekend! I can’t wait to peruse the vendor hall and used curriculum sale! On my “to buy” list is Spelling You See, Life of Fred Math, IEW, Integrated Physics and Chemistry, and more! That’s fantastic! Hope you enjoy it! I would buy the supplemental materials for our history that we haven’t been able to afford yet and probably finish the purchasing of the Apologia Worldview course so we were ready and prepared to move on to the next books right when we finish the one we have. Thanks for the encouragement! Thank you for this post! This was our first year going to a conference. We did not go locally, but now i can see the importance of supporting it locally. I would buy history books both fictional and non-fictional and probably a high school science curriculum for this year. If I won, I would buy science lab materials for my daughter….and for her 6 siblings. I would buy our art dvds and christian curriculum if I won. I’ve been going to conventions for 18 years! I always learn something useful- either from a speaking session or from talking to the vendors. I love looking at curriculum that I’m considering. Rainbow Resources has long been one of my favorite vendors. This year I’m needing to buy several things from Memoria Press. Thank you! Oh my I love Rainbow Resource, I would start with literature and go from there! Thanks! We love our homeschool conference too! If I win this, would love to use it to purchase 1st and 4th grade curriculum for my girls. I would purchase 4th grade curriculum. Thank you so much for the opportunity. Love Love Love going to our convention each year. It refuels my energy for the new year! Such a blessing. I would buy all of our needs for our high schooler. Thank you for offering this giveaway! We desperately need help this year. We need help this year so badly. I would use the shopping spree to purchase homeschool curriculum for my four kids. I still need several things for each of them, including Language Arts and History for my youngers and Governent/Econ and Bible for my olders. If I won, I would buy science & art supplies and read alouds. Thank you for this opportunity and all the wonderful resources on your site. I would buy Write Shop and Sequential Spelling and some fun “school” stuff. I would buy kindergarten materials for my son and help out a family at church. Thanks for the giveaway!!! I would buy some science kits and 8th and 11th grade curriculum for my boys! i think I would spend some on another family and then maybe also get some more of the SSRW curriculum for us. If I win I’ll buy some early learning materials. Thank you for posting this giveaway. Rainbow Resource is such a wealth of resources and was a blessing our first year homeschooling. If I won, I would use the gift card to purchase various resources that would help keep my son engaged but would also be easy enough for him to understand as he has a diagnosis of being on the high functioning end of the Autism Spectrum. He is highly intelligent but needs the material broken down into chunks which an be a challenge, especially without the proper curriculum. I bought everything that I needed for this year, so if I won I would pay it forward and help other moms get what they need for this year.